There were a big number of entries in the 40x20 championship. A total of 111 players entered in the singles and 62 pairings in the doubles. There were 18 different grades played with 7 clubs sharing the titles. The biggest entry was in Junior B Singles with 32 entries. This proved to be a very competitive competition. The Titles were spread out over 7 Clubs. Kells won 7 titles St Canices won 3 titles Mullinavat. Talbot’s Inch and Clogh winning 2 titles each. With O’Loughlin’s and Windgap winning 1 title each. Winner Brian with runner up William Love Clogh and Referee Billy Bourke O’Loughlins. Senior singles win for Ciarain Neary (Talbots inch). Like the 40x20 these championships were well supported. A total of 82 players entered in the singles and 50 pairings in the doubles. The Masters players made up 46 of the singles entries and 27 in the doubles entries with the senior singles attracting 13 entries and the senior doubles with 7 pairings. There were 18 different grades played with 7 clubs sharing the titles. The biggest entry was in Junior B Singles with 22 entries. This proved to be a very competitive competition. Kevin Woods of St Canices took this title from Club-mate Jimmy Long. The Titles were spread out over Kells winning 7 titles Kilkane Winning 4 titles, St Canices winning 3 titles Clogh winning 2 titles, with Mothel, Talbot’s Inch, and O’Loughlins winning 1 title each. In 2011 Kilkenny ran an open 40 x20 competition in two grades. Open 1:- Ciarain Neary (Talbots Inch).Anthony Martin (Kells). Diarmuid Burke (Kells). John O’Neill (Goresbridge). Dan Breen (Kells) Andrew Lawlor (Clogh). Brendan Burke (Kells) Ger McGrath (Kells). Open 2:-Jimmy Neary (Talbots inch), Eamon Purcell (Windgap). Gerry Murphy (Goresbridge). Jimmy Purcell (Windgap). Vincent O’Neill (Goresbridge). John Fitzgerald(Kells). Aaron Davitor (Goresbridge). StephenO’Dwyer (Kells). The third County one wall championships were held in Windgap. This is becoming a very popular event with eighteen players contested the three grades. Open, Masters “A” and Master “B”. Played in cool and sometimes misty conditions that suited the players more than last years blistering heat the contestants had the breeze to their backs as they faced into the courts tucked into the hill underneath the parochial house. On the day new champions were crowned in all grades as Eamon Purcell of Windgap took his first Masters "A" at the third attempt. In the semi he defeated the reigning champion brother Jimmy and the previous champion Paul Dowling of Mothel in the final. In the Masters "B" Final Michael O'Shea defeated the holder Eddie English of Goresbridge in two close fought games. In the Open competition played on a round robin basis Ger. McGrath from Kells defeated Dan Breen in two games to take the title. In the Open shield final Shane Walsh (Windgap) and Michael Fennelley (Kells) played a three game thriller before the Kells man took the game 2-1. Other participants in the Open that attracted a number of debutantes were John Fitzgerald, Fergal Lalor and Ger. Anthony whilst John Ryan, Liam Mahon, Michael Dalton, Jimmy Shanahan, Tom McGrath, and Simon Walsh participated in the Masters. A special word of thanks to Orla O'Shea, Julie Walsh and Kathleen Purcell for manning the food kitchen all day. Kilkenny Competed in 25 finals winning 14 grades and loosing in 11. This was a great achievement. Below is Nickey Anthony and Brian Manogue intermediate Leinster champions. Kilkenny had great success winning 14 Leinster Title. The Ladies doing very well winning the Double in Minor. Ciara Mahon winning the singles and Partnered by Clogh Club mate Mary Phelan to take the Double and Junior B with Rachel Hogan (Kilfane) also took both titles winning singles and partnered by Marie Walsh (Kells) to win the doubles. The Funchion Brothers Patrick and Peter (Kells) doing the double at under 21 Level with Patrick winning the singles. Michael (Ducksy) Walsh also took both Masters A titles he was amply partnered by D.J.Carey in the Doubles. Mullinavats Joe Walsh was another Kilkenny player to do the double in Silver Masters B his partner in the doubles was club man Liam Law. Intermediate Doubles winners were Nickey Anthony and Brian Manogue. Joe Anthony (Mullinavat) in Emerald Masters B Singles. And Michael Dalton (Kilfane) teamed up with Jim Dooley (O’Loughlins) to take the Diamond Masters B Doubles title. 40x20 Open Club title for Kells Brian Manogue. Patrick Funchion Peter. Funchion Ger McGrath had a great run in the Leinster Club open competition but lost the All Ireland Semi-final to Balahadreen. Kilkenny win 21 Titles in the 60x30 Championships. The Ladies pulled of a magnificent treble winning both grades in Minor. Junior B and Intermediate. Ciara Mahon and Rachel Hogan won their 4th Leinster titles of the year with Marie Walsh picking up her 3rd Leinster title of the year. While Rebecca Mulholland won both Intermediate titles Ciara Mahon once again was partnered by Mary Phelan. While Rachel Hogan was partnered by Claire Grace (Windgap) in the doubles in Intermediate Rebecca Mulholland Had a mighty tussle with doubles Partner Marie Walsh to win the Intermediate Singles title. Ger McGrath (Kells) pulled out all the Stops to win the Under 21 Singles While Chris Dawson/Graham Clifford (St.Canices) were victorious in under 21 doubles. Michael (Ducksy) Walsh also picked up his 4th Leinster title Wining the Masters A Singles and the Doubles with D’J.Carey(Goresbridge). St Canices Pinched up the Over 35 B doubles title with Davie Clifford and Sean Quigley. O’Loughlins Stars Billy Bourke and Philly Parsons won in the Silver Masters A Grade. Kilfane’s Tom Dooley had a great win in the Silver Masters B Singles Grade. Paul Dowling (Mothel) teamed up with O’Loughlins played Chris Dunne to take the Silver Masters Doubles title. Eamonn Purcell Won the Golden Masters B Singles title. Gerry Murphy (Goresbridge) teamed up with Jim Dooley (O’Loughlins) to win the Emerald Masters B Doubles title. Paddy Reilly (Talbot’s inch) was another Kilkenny to do the Double winning the both Diamond Masters A titles his partner in the Doubles was the very reliable Seamus Reade (Talbot’s inch) Jim Dooley after Been successful in the Emerald grade added the Diamond Masters B Title to his collection giving him his 3rd title of the year. Junior B team Leinster win For St.Canices (Dylan Clifford. Clinton Maher, Canice Pratt, Sean Quigley). Players who won double titles in 60x30 Were In Masters Michael Duxie Walsh and Paddy Reilly (Talbots inch) and the Ladies were. Ciara Mahon Clogh In minor, Rachel Hogan (Kilfane) in junior B, Rebecca Mulholland (O’Loughlins) in Intermediate. All Ireland Junior B Club Semi-final and final-final St. Canice's, Kilkenny (Dylan Clifford. 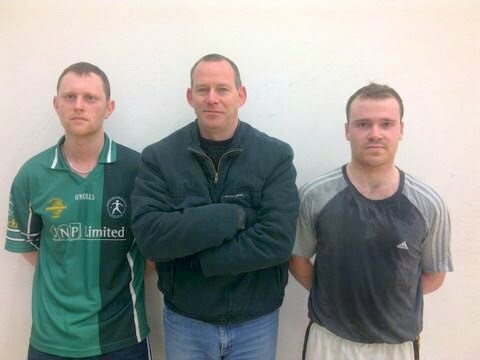 Clinton Maher, Canice Pratt, Sean Quigley) defeated Corduff, Monaghan in the semi-final. In the final, Broadford, of Limerick (Christopher Enright, Paul Murphy, Anthony Donnelly, Sean Murphy, Pat Donnelly) were to strong for the city men they lost 84 to 40 they can be proud of this achievement as this is a tough grade to win. Under 21Doubles After a great win over Antrim (Sean Clarke / Aaron Burns) 21-3, 21-4 in the semi-final Kilkenny Patrick /Peter Funchion from Kells continued on their winning ways. They put in a tremendous performance in the final against favourites Tipperary (Fergal Collins /Darragh Hardy) defeating the Tipperary stalwarts 21-19, 21-12. A great moment for the Kells Brothers. After a great win in the doubles Patrick Funchion had to settle for the sliver medal Patrick defeated Antrim (Sean Clarke) 21-18, 21-3 in the semi final. But in the final Tipperary got revenge for the doubles defeat here Fergal Collins was the winner beating Patrick in two games. Ladies Junior B Singles. Kilfane’ s Rachel Hogan had a tough encounter with the very agile Ciara McManamon in Crinkill Rachel was unlucky to loose the first but the Mayo lass finished the stronger winning 21-20 21-12. In the JBD Rachel teamed up with Maria Welsh Kells their opposition was the Mayo sisters Ciara / Clodagh McMenamon who proved to be to strong for the Kilkenny Duo they lost 21-10, 21-10. Michael Walsh easily accounted for Cork’s Stephen Palmer on the score of 21-9, 21-7 Once again the mystro proved he is the best masters player on the scene. There’s not much more can be said on this man. In the Doubles semi-final Antrim’s (Paddy Crothers/John McGarry) defeated Kilkenny’s (Michael Walsh/DJ Carey) 21-11, 13-21, 21-10. Kilkenny (David Clifford/ Nickey Reilly). They put in a tremendous performance in the final beating Mayo pair Jason Judge/Patrick Foy 21-20, 20-19. Intermediate Doubles Nicholas Anthony /Brian Manogue Mullinavat / Kells had a convincing win in the Semi-final over Cavan (James Brady, Patrick Clerkin) 21-9, 21-13. The Kilkenny duo were very unlucky not to reach senior status they were narrolly beaten in this intermediate final by Diarmuid Nash/Niall Malone) Clare 10-21, 21-17, 21-17. The Kilkenny duo actually outscored the opposition 55 aces to 52 in this game. Silver Masters B Singles. Joe Walsh Mullinavat was the dark horse in this event. The senior 60x30 player had little difficulty defeating Down (Sean McNally) in the semi-final and in the final defeated Tipperary (Jim O’Brien) 21-11, 21-6. In the Silver Masters B doubles Joe Walsh teamed up with the very reliable Liam Law to defeat Antrim (Stephen Roberts/Gerry Rafferty) 21-9, 21-11 in the semi and in the final defeating Mayo’s Aidan Bell/Sean Cunnane 21-13, 21-10. Diamond Masters B Doubles Tipperary (Andy Purcell / Denis Gleeson) were lucky to win the second game in this tie the Kilkenny duo Michael Dalton / Jim Dooley) put in a tremendous effort to get to 20 but the final hurdle was to high Kilkenny lost 21-10, 21-20. Kilkenny Chairman Joe Anthony travelled to Armagh to contest the Emerald Masters Singles Semi-final his opposition was: Antrim (Robbie McMahon) this must be one of the fittest Emerald players on the scene he defeated Joe 21-5, 21-3. Kilkenny girls competed in all 6 of the minor Junior B and Intermediate Ladies 60x30 all Ireland Finals. Kilkenny reached 19 All Ireland titles in the 60x30 code winning 6 and loosing in 13. This for any other county would be a good result but in Kilkenny we feel we should have more maybe we are greedy who knows. Congratulations to our winners and condolences o the runner are up. There was great performance’s by the Kilkenny players. Jim Dooley O’Loughlins put in a great amount of training for this final and duly got his reward with a great win over Tipperary’s Andy Purcell. Michael Ducksy Walsh again on top of his game did the double again winning the doubles with D.J.Carey making amends for the 40x20 defeat. The O’Loughlins duo of Philly Parsons and Billy Bourke added another title to their previous haul of titles with a win over Roscommon’s Anthony O'Donnell/Cormac O'Brien) 21-16, 19-21, 21-6. The Talbot’s inch Masters Seamus Reade/Paddy Reilly they has a tough encounter with Mayo (Matt Coady /Tim Hughes) before winning 21-19, 21-10. Rachel Hogan Kilfane made up for all her disappointment in the 40x20 final taking Both Titles in the Junior B grade. Rachel put in a great performance to beat Claire McMenamon (Mayo) in the final this girl had denied Rachel Victory in the 40x20 so sweet revenge for the Kilfane star her partner in the Doubles was Claire Grace Windgap disappointingly they received a w/o from the McMenamon sisters in the doubles. Under 21 Doubles Here the St Canice's Pair Christopher Dawson/ Graham Clifford were playing an inform Limerick pair op Padraig O’Carroll /C.J.Fitzpatrick the Kilkenny lads fought all they way in this final they never gave up. To reach this final was a mighty achievement for them. In The over age grades Eamon Purcell Windgap was very unlucky to loose a third game to Pat Donnellan Clare 21-20. Paul Dowling / Chris Dunne were very close to winning in the Silver masters but the luck on the day went to Mayo (Sean Cunnane/Martin Vahey) they lost a very close game 21-19, 21-20. Tom Dooley was another player who didn’t get going. On the day he was beaten by Joe Dowling Mayo. Doubles champion Paddy Reilly struggled to get in to his stride over Martin Cronin Mayo loosing in two games in the singles Semi-final. Gerry Murphy and Jim Dooley will feel they might have won this tie over Sligo (Michael McMorrow /John McLoughlin) they lost in a third game. Davie Clifford and Sean Quigley couldn’t get going in the over 35 grade they went down in two games to Limerick (John Noonan/Pat Doody). Ciara Mahon played in both minor finals the opposition in both was current minor Champions Cork. In the Singles she lost after a great game with Catriona Casey 21-11 21-14. Her partner in the doubles was Mary Phelan again Casey and Aishling O’Keeffe was tho opposition the Kilkenny ladies pushed hard and put it up to the Cork girls they eventually lost 21-14 21-18. Intermediate girls, here Rebecca Mulholland reached both finals as well. Unfortunately the opposition was current Senior Doubles Champion Mayo (Amy Corrigan. But regardless of the oppositions status Rebecca gave a good account of herself. She lost 2-0. Marie Walsh was her partner in the doubles and opposition was Mayo (Amy Corrigan/Leona Ryder).the Kilkenny girls were under dogs going in to this final but they fought all the way making the Mayo ladies fight for every Ball but in the end the strength of Corrigan proved to be the difference Mayo went on to win 21-9 1-14. Ducksy Walsh & Tom Sheridan reached the final of the National Open defeating Michael Finnegan Michael Gregan 31-18 and Dessie Keegan & Joe McCann 21-20, 14-21, 11-4. Final Before loosing to Barry Goff /Colin Keeling (Wexford) 21-15, 21-20. Brendan Hosey & Andrew Lawlor (Clogh) Put in some great performance on their way to this final on the way they beat Kilkenny /Kerry combination John Fitzgerald/ Colm O Luing, they pipped local contenders Peter Flanagan & Eugene O'Reilly 31-30. Aenghus /Patrick Frawley (Clare) fell in the Semi-final. In the final Barry Devlin & Shane O'Neill were the younger pair and this was enough to get them over the line winning out in a tie break. Mens 23 & U Doubles Dan Breen & Ger McGrath lost to the very strong CJ Fitzpatrick & Padraig O'Carroll (Limerick). In Masters Billy Bourke teamed up with Frank Daley (Dublin) they lost this final to Robbie McCarthy (Westmeath) Noel Murphy (Offaly). Veterans Seamus Reade/Paddy Reilly (Talbots inch) Lost their final to a much Younger Meath pair James Reilly & Anthony McConnell. Seen here is a group at the 60x30 nationals in Abbylara. With Masters players Billy Bourke, Paddy Reilly and Seamus Reade. Ciara Mahon (Clogh) was Kilkenny`s sole winner of the weekend where she defeatedall opposition in the Ladies B grade. Ciara playing great handball all weekend blew away her opposition Marguerite Gore(Wexford) in the final. She never let upon her opposition and won in straight sets 21-1, 21-2. Well done to Ciara who now moves up the Ladies A next session. A brilliant Result for Peter Funchion/Sean Foley Callan Winning the senior Doubles All Ireland Title. They Defeated St.Mccatens Monahan in the Semi-final and in the final defeated the favourites dft Roscommon CBS (Cian Connolly, Mark Nally) 21-10, 21-18. In the Boys Senior Singles Eoghan Hennessy Castlecomer C.C. Came up against an in form Martin Mulkerrins Galway and the Galway ace won in two Games. In the Senior Singles Mary Phelan Defeated Leona Ryder Mayo in her Semi-final. And in the final she put in a great display against Martina McMahon Limerick before going Down 2-1. In the Junior Singles Ciara Mahon Loreto found Lauren O’Riordan Roscommon to hot to handle Ciara lost 2-0. The All Ireland Intervarsitys 60 x 30 A Team Championships was held in Thurles on 17th September, 2011. In the Semi Final the WIT (Waterford Institute of Technology) Team of Patrick Funchion, Peter Funchion, Ger McGrath and Nicholas Anthony defeated the DIT team of Stephan Cooney, Seamus Casserly, Shane Heraty, Chris Gavaghan 74-46. In the other semi-final the DCU Team of Brian O’Sullivan, Ciaran Neary, Peter Hughes, Terry McElvaney defeated the UCD team Martin Mulkerrins, Micheal Busher, Kevin Mulligan, and Sam Temple 64-40. In the Final WIT defeated DCU 69-59. This is the 3rd year in a row that Waterford Institute of Technology have won the A Team All Ireland Final in the 60 x 30 Intervarsitys Team Championship. This was an eagerly awaited event. Many travelled from Kilkenny for this black tie event. County nominees representing Leinster were Masters Player of the Year Michael Ducksy Walsh, Coach of the Year Billy Love, Clubman of the year Brendan Hosey, Girls Youth player of the Year Ciara Mahon and Clogh H.B.C. Club of the Year. Leinster had recognised the great work done over the year by all the Kilkenny and put them on their nominees list for national awards. On the Night Michael Ducksy Walsh was Kilkenny’s only recipient to receive National acclaim. He received the National of Masters Player of the Year award and the award was presented to him By Kilkenny Great D.J. Carey and Tyrone star footballer Peter Canavan. Ducksy is still regarded as one of the best players in Ireland and he is constantly defeating younger up and coming young players in both courts. This award was his testimony to training and fitness may he reign supreme for many years to come. For Leinster to give five awards to Kilkenny shows the high regards they have for achievement in the County. Representing Kilkenny on the Night were Guest Speaker D.J. Carey. Development Officer Seamus Reade, County Treasurer, Leinster Secretary Liam Mahon, County Secretary Billy Love, County Juvenile Officer Brendan Hosey, Chairman and Secretary from Clogh H.B.C. Colm Love and Josephine Cooney. We must also thank all the other Kilkenny Club people who supported the event on the night. The 2nd Annual Tommy O’Brien Tournament, remembering a man who gave a lifetime of service to Handball at all levels in Ireland, the top exponents of 60 x 30 Handball converged on the Inch to celebrate his contribution. Over the 5 days of Handball, Talbots Inch hosted tournaments at Intermediate / Senior and Open levels, while on Saturday and Sunday, Juveniles from Kilkenny and Meath played out a challenge match, with Girls Juveniles from Kilkenny also putting on an exhibition. Starting on Tuesday night, the Intermediate / Senior tournament proved to be a very competitive event, with players from Kilkenny, Wexford, Tipperary and Carlow taking part. In the intermediate grade Ciáran Neary (Talbots Inch) and Ger Coonan (Tipperary) defeated Nicky Reilly (Talbots Inch) and David Clifford (St.Canices), winning 21-15, 21-13. The final of the senior was between Current holders Michael Ducksy Walsh/Tom Sherridan and Barry Goff/Colin Keeling (Wexford After a titanic struggle the Wexford men were triumphant Winning 21-19. 21-14. Putting new names on the Tommy O’Brien Cup Well done to the Talbot’s inch club for running such a high profile tournament and keeping 60x30 handball at the top of the rankings. Great praise must go to all the players that travelled for the weekend, to organisers, Ducksie Walsh, Seamus Reade, Jimmy Neary and Michael Reade, Talbots Inch club, the O’Brien family and to all the ladies who provided magnificent catering over the weekend. A usual this turned out to be a great occasion. The tournament got great support from all the players and supporters. From the start of competition on Tuesday through to the finals on Sunday the gallery was never empty and mostly it was full. Great credit to the Mullinavat Club and to Michael Ducksy Walsh for organising the tournament. (Photo: Ducksy Walsh, Tom Sheridan with Leinster Chairman John Kelly Louth). The Combination of Duxy / Sherridan was again the winning combination in the Senior event in the final they beat Robby McCarthy/Brian Carroll. In the intermediate final Carlow’s John Ryan/David king beat Johnny Brennan/Nicky Reilly in a tight game Also in Action were the Mullinavat Juveniles they beat Wexford in the Juvenile team. And well done to Corks Catriona Casey/Aishling O’Keeffe for travelling to Support the Ladies section they beat Mary Phelan /Ciara Mahon in the Ladies exhibition game. The Eamon Law juvenile sports star award winner was Mullinavat’s under 16 star John Walsh. Crossakiel -Talbots Inch’s Ciaran Neary partnering Wexfords’s Peter Hughes to win the McDermott Cup beating Leitrims Martin Rafferty and Jamie Murray in the final 21-7 17-21 21-11. Kells players take up one wall. They took part in 6 one tournament during the year. Good result for Kilkenny players in One Wall competition in University of Limerick on Saturday 2nd of April. Stephen O Dwyer was Mens C Winner. Dan Breen Mens B Plate Winner and Niall Mullally Mens B Plate Runner Up. Ger McGrath won Mens A Plate and Dan Breen Mens C Plate .Alan Funchion also took part. Ger McGrath won the Mens B Title at the Inis Mor Inagural One Wall Tournament. winning out 31-4 to top off a great weekend for the Kells Club John Fitzgerald won the Mens C Plate. Dan Breen was defeated by the narrowest of margins 19-18 in the Mens C semi final. in Mens C and Dan Breen and Shane Walsh in U23 B Grade, John Fitzgerald in the men`s Challenger plate. In the Mens 23 & Under B Cup Final Dan Breen (Kells) dft Shane Walsh (Windgap) and in the Mens C Cup Final Daniel Fenlon (Carlow) beat Ger McGrath (Kells). Stephen O`Dwyer was unlucky to come up against U17 World One Wall Champion and eventual champion Joshua Garcia(USA) in his first round but gave a great showing and this is great experience for Stephen as he is minor next year. John Fitzgerald (Kells) reached the men`s Challenger plate where he was defeated by Edward McCavitt (Armagh). In the Abbeylara One Wall Open semi final Dan Breen and Ger McGrath (Kells) were beaten by James Doyle/Darren Flynn 28-20 and they lost the open plate final to Niall O’Connor and Tadgh Carroll 15-11, 15-13. In the 1st round of the Junior Doubles Michael Fennelly (Kells) partnered by Maighread Ni Dhuill dft Aoife McCarthy/Ellen O Connor 21-10 but were defeated by Andrew Dowling/Padraig Townsend 25-11. This year we have made great strides in developing our web site. The board becidee we needed someone to look after the Web site and Ger Doyle (Windgap) stepped up to the mark his input has seen the site grow to a point not possible without some one looking after it. The number of hits on the site has surpassed 8.000 which is huge. We also have to move from the present server to a new server and this will be completed by the end of the year. So well done to all involved in the promotion of the site. Thanks to Chairman Joe Anthony who has upheld his position as chairman to the highest standards. Treasurer Liam Mahon who keeps our accounts up to date with great efficiency, P.R.O. Ciarain Neary, Juvenile Officer Brendan Hosey who took over from Eddie English did a great job in his first year and for his great commitment to our young players, and also Development Officer Seamus Reade. GAA Rep Gerry Murphy. Facilities Officer Michael O’Shea and vice chairman Ger Doyle who also updates our Web site. I would like to thank all the County Officers who have been of immense help thought the year. Thanks to the Leinster Officials and /especially to Leinster Secretary Liam Mahon who was of immense help to me to over the year.To the Kilkenny GAA board in particular Mr Paul Kinsella, Mr Ned Quinn, & Mr Jimmy Walsh, for their dedication to Kilkenny Handball this is very much appreciated. Also to thank Ciarain Curran and his staff in Croke Park for all their help throughout the year. Also a word of thanks to our sponsors.Last but not least I thank all Players, Coaches and Parents and to the Ladies in the clubs who supply tea and sandwiches whenever they are required. I would like offer the Boards sympathies to Families who suffered bereavements over the past year.